Made from roasted organic peanuts. Ready to spread or use in cooking. Organic Peanuts Whole Skin On (100%). Produce of more than one country. Organically grown. 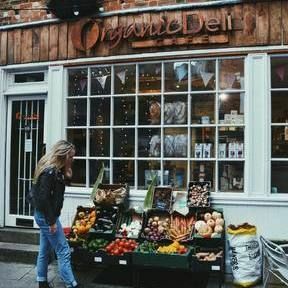 Organic Deli Café is an independent, family-run spot established in 2010 selling artisan and organic breads, snacks, cakes, teas, nutritious staples, and unique gourmet products, including CBD coconut oil. We're also a cafe, so when you're next in the area, come and join us for a hot chocolate and nutritious bowl of grains or granola!